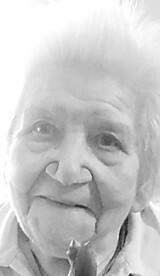 Lydia Wlasiuk, age 91 years, of Archbold, passed away Tuesday afternoon, April 2, 2019, at The Toledo Hospital. She was born Feb. 5, 1928, in the Ukraine, the daughter of Basil and Maria Litwinko. She married Mikolaj Wlasiuk Sr. on May 31, 1946, and he preceded her in death on Oct. 2, 2005. She came to the United States in 1950 and lived in Bryan before moving to Archbold in 1952. She was a devout Christian and prayed for her family and friends daily, and enjoyed gardening, cooking, and spending time with her family. She was a former member of the Ukrainian Orthodox Church in Fort Wayne, Ind., and currently a member of St. Peter Catholic Church in Archbold. She is survived by seven children, Walter Wlasiuk of Fair Oaks, Calif., Sam (Katie) Wlasiuk of Rocklin, Calif., Anna (Renald Bacigalupi) Wlasiuk of South San Francisco, Calif., Paul (Sharon) Wlasiuk of Gold River, Calif., Nick (Susan) Wlasiuk of Stryker, Helen (Spencer) England of Tequesta, Fla., and Dennis (Karen) Wlasiuk of St. Clair Shores, Mich.; nine grandchildren; and 10 great-grandchildren with one on the way. She was preceded in death by her parents; her husband; a son, Gregory “Pinky” Wlasiuk; five brothers, and two sisters. Services were held on Monday at 11 a.m. at St. Peter Catholic Church with Father Stephen Stanbery officiating. Interment followed in the Archbold Cemetery. The family suggests that memorials be given to St. Jude’s or for Memorial Masses. Short Funeral Home in Archbold was entrusted with the arrangements. www.ShortFu neralHome.com.